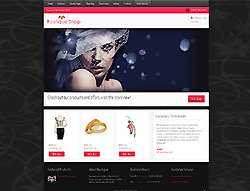 Boutique Shop is a responsive Joomla! template built on the slick warp framework. The responsive design makes it suitable for all screen resolutions. This template requires no framework plugin to be installed in order for it to work. The stylish and easy to use admin panel together with a wide range of customizable features enables the creation of an elegant looking site. If you wish to sell your products or any digital goods online, then this is the template for you. The J2 store eCommerce component will turn your site into an online shop with amazing results (payment plugin should be purchased separetly).